Best Math Games Multiplication. Learning Multiplication Facts The Fun Way. Math games multiplication facts will get your kids excited about learning math! Here are two simple yet very effective math learning activities that will them engaged with learning their multiplication facts! You will roll the pair of dice 8 times. 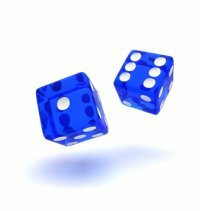 Each time you roll the dice, multiply the two numbers that come up. Add your 8 numbers together for a final total. Can you get to 100 in 8 rolls? See how many rolls it takes until your total reaches 100. If you are very lucky, what is the minimum numbers of rolls required to reach 100? The expected value of one roll is 12.25, making 98 the expected value after 8 rolls. 23 of the outcomes are less than 12.25, and 13 are above. Two players can play. Shuffle the red cards and the green cards, keeping them in two separate decks. Turn over one red card and one green card so that both players can see them easily. For example, suppose the red card is “20-29” and the green card is “7”. 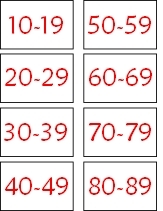 You want to name a multiple of 7 that is in the 20s. (In this case, the two possible answers are 21 and 28.) 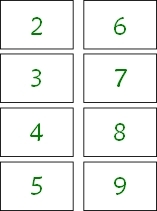 The first player to name a correct number scores 1 point. Put the cards back in their decks, shuffle them, and turn over one red card and one green card to begin another round. You can play for a certain amount of time (whoever has the most points wins), or you can play up to a certain total (21 points, for example). Extension: There is only combination of cards that doesn’t have an answer. What is it?